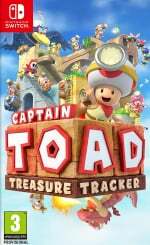 We're just a couple of weeks away from Captain Toad: Treasure Tracker's new launch on Switch and 3DS, and with the agonising wait slowly fading away with each passing second, Digital Foundry has been putting both versions to the test. These latest ports are interesting and worrying for a number of reasons, mostly thanks to the fact that the 3DS is significantly less powerful than the Wii U (the console that this game was originally built for), and that the Switch's touchscreen - which was an essential control method on Wii U - becomes useless when playing in docked mode. As it turns out, though, we needn't have had any doubts at all. For starters, the Switch version of the game easily matches - and then outperforms - the version on Wii U. Docked mode sees a gorgeous 1080p across the board, even including visual boosts to the game's menus for sharp images and text, and this is supported by a consistently solid 60fps. This frame rate carries over to handheld mode, too, with the resolution sticking to its native 720p this time around (the same resolution that was present in the Wii U version). When docked, players use a new gyro control pointer system instead of the touchscreen in handheld mode - if you're interested, you can try this out for yourself in the game's demo. The folks at Digital Foundry say that the 3DS is the real surprise here, though. Despite taking a bit of a hit in the graphical department with things such as texture detail and shader quality, the game "manages to hold up better than you'd think". It runs at 30fps, which is half of that experienced in the original, but this is said to be smooth and solid, with visuals that make it "one of the most attractive games" on the system. As hinted at above, a demo for both versions of the game has appeared on the Nintendo eShop. If you want to try it out before you buy, make sure to check it out on the system of your choice. Did you play Captain Toad on Wii U? Will you be giving it a spin for the first time next month? Let us know down below. I had tried the DEMO (3DS & Switch). Well.... if i can say, the game was like i had eaten very Creamy , Sweet & Greasy Birthday cake. After i finished eaten them, i didn't think i want to Replay the Same stage again, unless if i missed something. I'm in a tough position. On one hand, I have the game on Wii U and never double dip. I always try to sell the game and buy it again on the new system. Especially in this case, because I haven't really played it on Wii U with my current and growing backlog. Haven't achieved it though. Normal cover (no Selects), but people doesn't even ask questions. Problem is, anyway, the Super Mario Odyssey replacing the Super Mario 3D World ones. That makes both versions slightly different and worthy, but I don't know if worthy of an exceptional double dipping on my part. They reply to your question in the video. Another Wii U port, skipped. I'll pick this one up later on 3DS. Played the Wii U game, and loved it. It's hard to choose between these two new versions, as this is the kind of game that can greatly benefit from stereoscopic 3D when it comes to enjoyment. Much like Luigi's Mansion did. Small stages/rooms to explore with puzzles to solve, all while looking stunning. As if you can reach in... But I play my Switch way more often now. Got this coming on Switch. Own on Wii U but it’s such a lovely game I pre-ordered the Switch version on Amazon Prime back when it was £26. Will buy for 3DS secondhand from CEX when cheap. It's a lovely game but I've already 100% completed the Wii U version. I'm not sure if I want to buy it again for a small resolution increase and a cursor permanently on screen. Um... on what aspect did you feel disappointed about Super Mario Odyssey ? I thought Super Mario Odyssey was Quite interesting, but was not really Wow. But, Super Mario Odyssey was my First Mario games that i finished Very Quickly (Took 2 weeks to finished). But, my Super Mario Galaxy Wii was still NOT Finished yet since i bought on 2015. In my opinion, Super Mario Odyssey was Very different. I like the Free roaming but it felt i was in Isolated island for each Kingdom i visited. Super Mario Galaxy was pretty good, i like the Stellar theme, but i still lack of Hype to finish the game somehow. Maybe it's Too Perfect or Perfect but a little bit Boring at the same time. Eh, reconsidering getting one of these because of the lack of new content. They should port Super Mario 3D World to the 3DS as well. I played the heck out of the Wii U version but I’ll be getting it again on Switch. Such a charming and enjoyable little game. I tried the demo on both Switch and 3DS just for kicks. 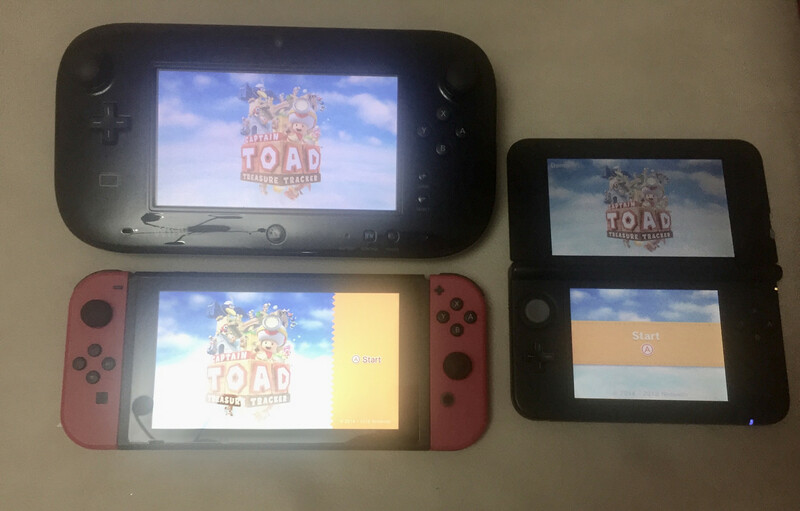 The Switch version was exactly what I’d expect (the gyro pointing with the pro controller is going to take some getting used to), but I was pretty impressed with how the 3DS version looked and played, and I was delighted to see it actually running in stereoscopic 3D, especially since everyone seems to be ditching that feature in recent 3DS games. Ultimately I’ll be getting the Switch version, though. I’ll be curious to see the sales performance of both versions. If the dual release of Fire Emblem Warriors is any indication, I expect the 3DS version to bomb in favor of the Switch version. For how long did your friend borrow you his Switch and the game? I just found it funny, that you find SM3DW much better. I mean 3D World is a very good and fun game, but SMO surpasses it in almost every way. Having played the demo on switch and 3ds now I can definitely say I’ll be buying for 3ds... something just feels right with it on 3ds instead of switch. Really fun game though so far! @N64SNESU Umm... This is a Captain Toad article. Odessy was a very poor Mario game. Some WiiU games, like MK8, deserve to be ported to the Switch so that we can have them sooner while we wait for the next entry... Captain Toad however, should be a proper sequel on Switch. I wonder at this point what games are worth owning older WiiUs for since most of it's excellent but small catalog has already been ported. All that remains is TMS#FE, SMM, Mario 3D World, NSMBU, SF0, Color Splash, W101......annnnd, I think that's about it for notable WiiU specific games? The Kirby "draw the line" game I guess can count, plus Amiibo Festival, but...only slightly, nobody wants to own an old WiiU for that. @NEStalgia Yeah, it's getting interesting, but as my family are huge fans of Nintendo Land and the close-to-zero-percent chance of that coming to Switch, I think we'll be keeping the Wii U in good running shape for years to come. I'd give good odds on Mario 3D World coming to Switch relatively soon. Maybe even a surprise release this year. It would be nice if they could integrate some clever online multiplayer features and launch it with the new online service, but maybe that's too much to ask. Even without it, it's the best local multiplayer Mario, and local multiplayer is still a strong point for Switch — even though Nintendo would prefer every individual owns their own. Wasn't there a rumor or something that W101 was coming over? That would be nice in 1080p to see the detail better, actually. @MrBlacky exactly and some. That guy is negative about everything on the switch. Not seen one positive post from him. MO is a superb game. I hope Switch owners support this game cause is phenomenal and deserves a sequel. Sadly, I'm skipping it cause I already have it on Wii U. 3D World would make sense. And I wouldn't doubt TMS#FE as well before either FE or SMTV come out. Maybe with full localization this time, though I honestly love the Japanese soundtrack, and I'm not one of those "why don't we get the Japanese soundtrack" people. W101 was rumored, but that would need some heavy tooling to work on Switch. Still it doesn't deserve the death it got, but it was an oddly experimental game that isn't a certain "instant hit"....it's a cult kind of "love it despite its flaws" thing. Most of WiiU's library were hit games that never saw daylight due to being trapped on a dead platform. W101, Devils Third, etc are games that were legit niche and iffy of success on their own merits. Pikmin 3...there's another one on WiiU. It still has a few unique things I guess. Have it on Wii U but I'm tempted to double dip for the 3DS version. I never played this on Wii U so I was planning to get it on Switch, but after watching that video, I might actually get the 3DS version for the sake of having a proper stylus-controlled touchscreen. I found the 3D effect to be one of the weakest I have seen. It was really underwhelming, specially considering that it would fit perfectly for this kind of game. It wasn't a problem of my handheld, because it displays the 3D effect greatly with other games that did a great job with it like Luigi's Mansion: Dark Moon, and I have heard the same from other people that played the demo. I'll be sticking with the Wii U version for now; I picked it up last year and haven't quite gotten around to playing it yet. Loved Captain Toad on wii u. Absolutely not double dipping as I haven't with any of the wii u ports. Very disappointed with the lack of good new games on switch. People put wii u down but at least it had lots of great new games. Give us a new Mario Kart! @Tyranexx You know, I keep forgetting about XCX, in part because I keep just assuming it was already ported...it was such an obvious pick I think they held it off while XC2 + XC2 expansion were out. I imagine they'll have an enhanced port of X later on and/or tied to an X2. I think some of the systems of XC2 might really pay to bring to X. It comparatively rough, but thoroughly unique. @NEStalgia: Agreed on why they likely have held off. I personally enjoyed XCX when I played it earlier this year; it's not a perfect game, but at 100ish hours it definitely left me satisfied! Also, the ending definitely sets up the game for a sequel. Not gonna lie, in the first moment during the Digital Event, I speculated that DXM might have been related to XCX. @MrBlacky I gotta say I also enjoyed it more than Odyssey. Some magic fun factor was missing for me in Odyssey that both 3D World and especially 3D Land had in spades. Wish I felt different but for all it's jazz Odyssey gameplay felt a tad flat. Maybe It'll be different 2nd time around. Regards Toad. I'm gonna get switch but if I love it I'll go back to 3DS at some point cos I never got bored of stereoscopic 3D. I have a switch, but I think I'll get more use out of this on the 3ds. So I've decided to get that version. The 3DS version reminds me of Snes Life Span. As an old man I always used to say that Snes used closed to 100% of its capacity... that even with 32 bit systems (and also a 64 - that is not Jaguar do the math -) and with a N64 at home, I thought "Wow, I want Lost Vikings 2... and Megaman and Bass, even this Fifa 98 would be good as a collector!". And 3DS is impressive, having games that could be on Wii (the classic one, that was not HD). Hyrule Warriors, Super Mario Maker, Super Smash Bros are games above the limits of the hardware. Even the New Metroid and now Captain Toad are impressive. @Moroboshi876 I'm in the same boat. On one hand, I own the beautiful Wii U version. But I haven't played it enough, even though some day I know I will. Now, with the Switch and 3DS announcements, at first I didn't want to double dip. But it doesn't look like I have much of a choice given that the 3DS version will be in stereoscopic 3D and still have the new levels. I justify double dipping in that I may not play the Wii U version as much but why get a Switch version if I already own the full size HD version. With the 3DS version, I can get the same portability as the Switch and the new level gimmick too. @Magrane Good thinking... and you worsened my dilemma. I hadn't even considered 3DS version, because Nintendo's trend of abandoning the stereoscopic 3D made me automatically assume new releases don't have it. And I love it. And hate when they ditch it. That would be a way to play Captain Toad differently, and at the same time to give my 3DS a little love. But still... I have my doubts. A sad part of me wants Switch version in order to show my friends my dedication to the game through playtime log. @Moroboshi876 It is too bad that the 3DS play log isn't shareable! I have this on wii-u and whilst I started it, I still haven’t got around to playing properly. I think I paid £18. I’d love it on switch but I don’t think I will double dip until I see it on sale. I wish 3DS games had looked this good from the start. This video convinced me to get it on the 3DS. I love media in 3D and this game sounds perfect for that sort of display. I also own it on the Wii U and am double dipping, and I would highly recommend it to anyone who hasn't played it yet.